There’s a story in that painting. You can see it in the small heart that looks like a kiss from the wind, the alertness in the crow sentinels, and especially in the smile of the figure at the center. There’s more to it than the knowledge that she’s safe; that smile is beginning to dream of a future where she can thrive. It may not be a faery tale in a traditional sense, but wonder and enchantment are all there. There is blood on the end of the sickle moon, though no one but me can see it. It's the same moon that hung over the place I was born grown gaunt with homesickness. Or maybe I've just seen myself reflected in the moon as darkness inches across it, engulfing it so nothing of its past remains. The most familiar things look wrong under a moonless sky. I recognize nothing that looks like home. I embrace my darkness, but I do not let it consume me for I have the brightness of the stars in my soul. I let them point the way, if not towards home, towards a future where I shine steady as souls wax and wane around me. Have you ever taken a walk off the beaten track to find yourself? Tell me about it in the comments section for a chance to win a copy of the e-book. The contest closes on November 25, midnight EST. I will choose the winner and announce their names back on my blog. Stacy will also add the name of the winner to this post. Good luck! Cover art by Michelle Kennedy. Find her on her blog and Instagram. The Trouble with Wanting, and Other Not-Quite Faerie Tales is available now at Amazon and Barnes & Noble. Hi Rommy, Welcome! I like walking down beaten paths to get away from stress. It's fun to explore places you've never been. Congratulations on the new book! Hi Sherry. I like to visit new places every now and again to. It's just kind of neat to find things that you may not have been exposed to before. Also, being kind of a foodie, I love finding funky, off-beat places to eat at. Yum! I dance off the beaten track so much, that I'm pretty sure I've beaten the new tracks half to death already. So... hm, where to start? The first time (I remember) perhaps would be best. When I was 7 or 9, I was never very good at making friends of my own age. The child in me found other small children... sort of boring. We were never interested in the same things--they wanted to play with dolls, I wanted to know how to heal a sick goat... They wanted to play hide and go seek (all right, I loved playing hide and go seek, but... not all day). Anyway, after a while, I realized that if I wanted to be happy and be me, I had to befriend characters in books, and trees, and people who were old enough to be my grandparents. So I did. And I loved what I found: me... in places I belonged and with people who got me. I absolutely love your Rina, the way you help us see her wants through Stacy's art, and well... I just love this. I was similar as a kid. If people didn't understand my deep and abiding need to fight for Narnia, ramble around Green Gables with Anne, tell stories about the Bastille with Sarah, that was their problem. And yes, eventually I found people who not only got it but introduced me to their favorite literary friends as well. I would have never met them if I hadn't been myself. Great post. It's so nice to meet you. Your books sounds awesome. Already looked it up on Amazon. I agree. It kind of keeps the child in me alive when I find new places to find wonder in. LOL, no worries. The artist who created it (Michelle Kennedy) does some seriously amazing work. wow, love your post! I loved reading how you saw Stacy's painting. Your book looks wonderful. Oh this is wonderful, I enjoyed it so much! I'm glad you did Laurie. What beautiful words! Your work sounds so unique! Walking off the beaten path in life is something I know all too well. Thanks Miss Val. Yeah, I think some of us are experts at making our own way, when there is no path for us to follow. Even if the going gets hard, the results are often quite rewarding in the end. Very cool- will check out your book. Congrats on having a book and good luck. Great poem!! Thanks Holli! I've been very lucky to have supportive people cheer me on. Hello Rommy & Stacey. A year ago,I sold my home, packed a small U-Haul with only the necessities and moved my family to Texas. Although leaving all our family behind in California we traveled to unknown territory and made a path of our own. I have flourished personally here in one year than all my years in the same place. Sometimes you just have to leap and have faith in the new direction your life is going. Congratulations on the book! That must have been very intimidating to do. But it's so wonderful that you not only survived, you thrived because of the change.So congrats to you for following your heart to find where it is you truly belonged. Congratulations! The cover is very beautiful.. Thank you Krishna. The artist is an amazingly talented lady. A very nice post. Thanks Stacey for the introduction. My friend's art always tells a story I am glad someone else noticed. I love the cover of this book and hope it is a great success. Stacy's paintings are pure magic, aren't they? Thanks for the well-wishes Nicole. Hi Rommy! I really enjoyed your analysis of Stacy's poem ~ although"analysis" sounds so prosaic when your words are lovely and the art is Stacy's unique vision. 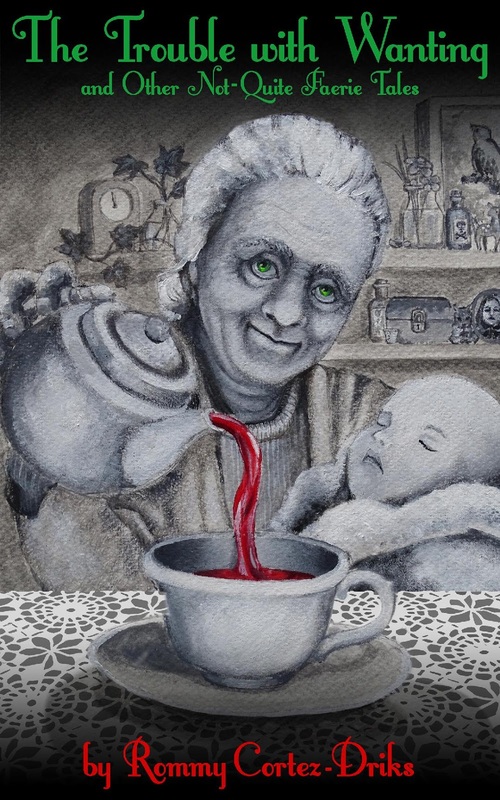 I found the cover of your book scary ~ I'm sure that's blood ~ especially when juxtaposed with the baby ~ Is it dead? Is that the baby's blood? But the cover would definitely make me open the book! I had to smile at your reference to Anne of Green Gables in the comments. I read it aloud to my school students a number of time. I so loved Anne. My paternal grandmother was a second cousin to Lucy M. Montgomery, and I visited the Green Gables house with my Great Aunt Maude when I was five. Of course, I visited Cavendish (Avonlea) and swam at the beach there many times. Now that I'm older I love the book because its has so many echoes of my childhood, especially in the dialogue and expressions, and the behavior of the adults ~ even the recitations. Thank you for making me think of those days. I moved up North and inland to the west of James Bay when I was ten. My experiences living in the bush among the Ojibwa in Lansdowne House and Lac Seul changed my outlook on life radically. They shattered the sheltered life I had led in the Maritimes, and from that time on I spoke up against injustice. Just call me Don Quixote, because I tilted at a lot of windmills; but I had some wins too, especially as a union leader. Oh wow! How cool is it to have that link to Lucy M. Montgomery and Avonlea! I haven't visited Cavendish yet, but it's on my bucket list of places to see. No matter how old we get, our childhood favorites tend to stick with us. I was delighted when my daughter was the right age to introduce her to Anne (though it did result in her sometimes dramatically flopping into a chair and proclaiming she was "in the depths of despair" when things like rainy days interfered with her plans). Now hurls down his gauntlet to thee! - LOL, I can't help it. I love that song and am a bit of an idealist myself). Here's to the wild-eyed dreamers, who's warmth creates an oasis of joy in the world. I have always wanted to try paranormal investigating. There are supposedly some very haunted spots in the Philadelphia area and its suburbs. We have some American Revolution era things bumping around in several areas, and a famously haunted penitentiary. There are places near where I live that give out some interesting vibes. I just haven't made the time to dive in deeper. I do get to walk around some of the wooded areas of Bucks County though. We were just shoved into winter yesterday with a giant snow storm, but I made time to drink in the beautiful fall foliage before everything iced over. LOL, I need my outdoor time no matter what the weather is, so I guess I am going to have to dig out the snow gear and be the weirdo hiking in the winter. A fabulous post, and thank you so much for the introduction, Stacey! Thanks Ygraine! I hope your weekend is wonderful. What a lovely post! Thank you Stacy and Rommy! So glad you enjoyed it CraveCute. Many congratulations on your new book. Thanks Tanza, I hope your day is lovely as well. Congratulations on your new book Rommy!!! Loved you post!! Hey dear Rommy! You sound beautiful writer to me as I can find charm in your stories! Yep I am one who listen to her own heart by making sure that my step is not going to hurt anyone! In my life many times I followed my intuition and achieved what I had to without taking the criticism on my nerves. Hi Baili. That's a good point you bring up, making sure that when we dance to the tunes in our hearts, our feet aren't trampling unnecessarily on the spirits of others. It's cold where I am now so it will be awhile before I can truly enjoy my toes in the earth, but I certainly will be letting them wiggle in the grass once it gets above 65. Thanks for commenting!